The Home Energy Saving Scheme of Ireland as implemented by the SEI is a boon to existing home owners who are concerned about the energy expenditure or the sustainability of their homes. What is the Home Energy Saving Scheme (HES)? The prime purpose of the HES is to “encourage and incentivize house owners to improve the energy efficiency of their homes in order to reduce energy use and CO2 emissions”. As a pilot project HES is currently being implemented in 3 specific regions of the country. In addition irrespective of the geographic location assessment the opportunities for economies of scale through working with clusters of houses is studied .The identification of these clusters and their management is by authorized energy management companies. The data gathered from the pilot scheme is being used to work out a National Level Scheme to the tune of Euro 100 million in 2009. It is envisaged this scheme will encourage owners of approximately 1 million of older dwellings in Ireland which are currently in need of some form of improvements in the key energy saving areas. These improvements are estimated to save approximately Euro 500 for each household annually in energy bills. Those who wish to participate in the scheme is advised what action they have to take to improve the key energy saving areas through a BER Advisory Report obtained from a BER assessor listed by the SEI. The participants are advised to obtain a BER assessment and advisory report before as well as after implementing the improvements. Who will be the responsible authority for the management of HES? 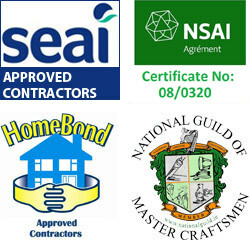 Sustainable Energy Ireland (SEI) is responsible overall for implementing the scheme. There will be local delivery agents in each region who will manage the scheme in their allocated areas under direction of the SEI. SEI believes this scheme will save approximately 175,000 tonnes of CO2 annually when fully implemented nationally. How can King Group CES assist you when participating in HES? Providing information, guide lines and estimates free of charge for the participation in the scheme. Providing best quality insulation material with or without vapor barriers having high R ratings along with fixing of same to the best international and local codes of practice. Providing weather striping material to minimize infiltration and leakage of heat and installation of same with best workmanship.